The Model 302101 2-Channel Heavy-Duty Gate Receiver is designed for use in gate operator applications. The receiver is housed in a heavy-duty metal cabinet. The cabinet meets NEMA 13 and JIC specifications and features a sealed strain relief bushing for wiring. An 11-inch wire whip antenna is included for local reception. The whip antenna connects to the receiver's Type-F antenna connector. 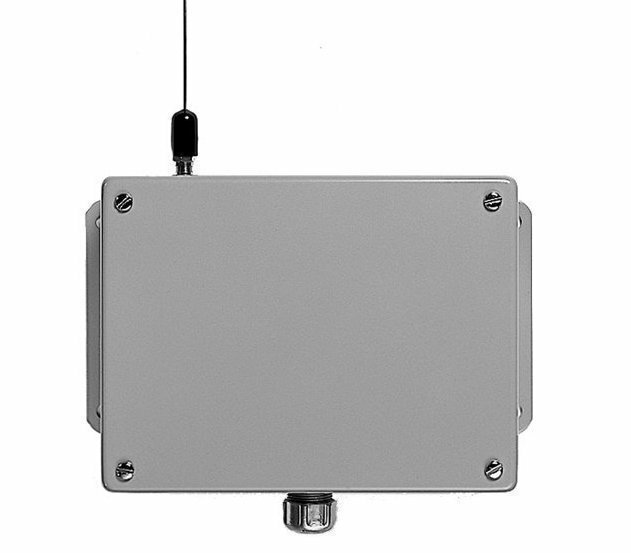 An external Model 106603 Remote Whip Antenna can also be used with this receiver in installations where the receiver is mounted inside a shielded metal enclosure, such as a gate operator housing. The receiver is programmed with a 10-position coding switch. When a transmitter set to the same code is activated, the receiver's output will activate, triggering the gate operator. Transmitter switch #10 selects which receiver channel will activate.